Geocaching may be the perfect Cascadia sport. It’s a puzzle (appealing to our inner geek), it’s an outdoor excursion (appealing to our inner jock), it’s a social trading game (yes, even cheerleaders can play). Geocachers hide containers with tradeable trinkets – pick one and keep it, and leave your trade inside. Cache stashes could offer small plastic toys, movie tickets, foreign money or stickers. Note your visit in the logbook with a stamp or signature, also kept in the container. Caches can be tucked away anywhere: city park, campground stream, old-growth tree or a mountain peak. How do you find these containers? With your Global Positioning System (GPS) device or cellphone, after retrieving instructions from a geocaching website (the most popular is geocaching.com, although regional sites also offer hide ‘n’ seek clues). It’s a game you can play anywhere – even when on a family vacation. This week, we’ll find out more about the kid-friendly sport of geocaching with Lisa and Martin Pedersen of the site FamilyNavigation.com, which focuses on their family life, geocaching and children’s activities. Lisa and Martin live in the Comox Valley of BC’s Vancouver Island, and are the parents of Annika, 5, and twins Bryce and Jada, 2. All photos below are courtesy of the Pedersens, and certainly bring geocaching to life! Q: How do you geocache with kids? Our kids are all young, so they just help us find the cache once we locate the area. Finding caches is a lot of fun, but hiding caches for other people to find is also important. Our oldest child has hidden a cache of her own and she enjoyed deciding on the trading items. Q: What sort of toys did your daughter put into the cache? For Annika’s cache, she decided that she wanted to include international coins. We had a lot of coins from our previous travels, which we put inside her cache. People are trading coins for ones in their collection. 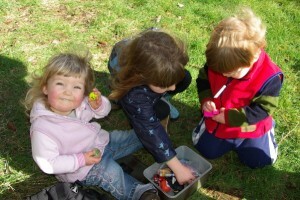 In other caches we hidden we’ve put geocaching supplies or small plastic toys that kids like. Q: Is it an all-season outdoor sport or best in summer? Geocaching is an all season activity, it just depends on how much one enjoys going outside in the winter months. Many caches are hidden at ground level so they can be a real challenge to find in the snow. 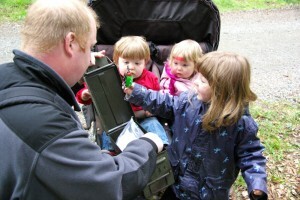 Like most outdoor activities, geocaching is most popular on warm sunny days. 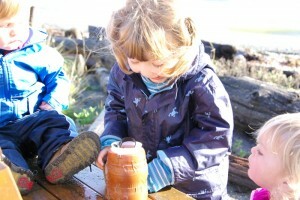 Q: Why is BC a great place to go geocaching with kids? BC is an outdoor paradise (yes, we are biased) so we love an outdoor activity that shows some of the hidden area gems. Many forests, mountain parks, lakes, rivers, beaches and towns are filled with geocaches, for all difficulty levels. Many geocachers live in BC, so there are lots of caches to find wherever you go. Q: Do you need any special equipment to go geocaching? To go geocaching you need a GPS receiver that can direct you to the coordinates of the hidden geocache. Like any electronic device, the cost can vary depending on the features you’re looking for. You can buy a GPS receiver under $100, and you can pay much more. We spent $300 for one that had special geocaching features and came with topographic maps. There are a lot of good, used GPS units for sale. If you are unsure if geocaching is for you then you may want to rent a GPS unit from an outdoor outfitter, or see if you can tag along with an experienced geocacher. Some cell phones now come with GPS capabilities as well. Q: Any geocaching tech that kids really enjoy? Travel bugs are a cool thing that kids can get into. You purchase these small tags that attach to a trading toy. You put the toys (with tag) into a cache and other geocachers will find the toys and move them on to another cache. Travel bugs are tracked on the geocaching.com website, so kids can follow their travel bugs and read the stories of their adventure. Q: What’s the coolest cache you’ve found? We like tricky caches hidden in a very clever container or those requiring us to solve a tough puzzle. We’ve found caches inside fake sprinkler nozzles, rocks, logs, among others. A fun cache we found lately took us to a street sign, where we found a small sticker with numbers on it. You had to figure out that this was the number of a book that was on the shelf in the local library. The geocacher had made arrangements with the library to shelve a logbook where people could find and then sign their name. After you have been geocaching for a while these sort of tricks become easier to figure out. This was a very unique cache and a fun one to do with the family. There are many extremely tough puzzle caches, or multiple step caches, for people who really like challenges. 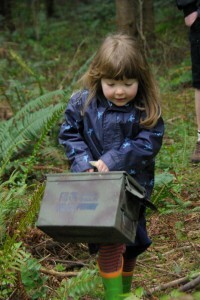 Q: Which caches do your kids like best? Our kids — mostly due to their age — like any large container with lots of things to trade. In their eyes the best caches are full of toys where they can trade something of equal or greater value for something new they like. Sometimes choosing a toy takes longer than actually finding the cache. Our kids think there is nothing like going for a hike in the woods and returning with a new toy. Q: What would you suggest to families just getting started or who want to learn more? If geocaching sounds interesting, then visit geocaching.com, the official website listing all the geocaches hidden worldwide. It’s very easy to get started but it may take a little while to get the hang of it, if you’ve never used a GPS before. There are many local geocaching groups you can find online. We have found that geocachers are very approachable and like to help out new cachers. You can also find out on the geocaching.com website if there are any free events in your area put on by local cachers (usually a very casual potluck) where you can meet people and get lots of tips. We recently moved back to Vancouver Island, to a town we did not know very well. Through geocaching we’ve now visited many of the local sites and found some hidden gems like swimming holes or shell collecting beaches. We’ve found that geocaching is a great excuse to go outside and spend time as a family. A word of warning, however: It is a very addictive activity. Need ferry fares, Oregon traffic maps or the Spokane weather forecast? There’s an app for that. Need the kids to chill on the long I-5 drive? There’s a nap for that. Here are 13 apps to consider for your trip in and around Washington, Oregon and BC. You’ll find all in the iTunes Store. A caveat: If you plan to use a web-boosted app in a country not included in your iPhone coverage, find out how much it’ll cost you to use your data plan. This app displays times at the American/Canadian border, so you can decide which crossing to take. Locals often choose the crossing with the least wait time, not necessarily the easiest one (Peace Arch). Crossing points are lined up vertically, in order, from Vancouver to New Brunswick. But you’ll need a map to navigate to nearby border stations, if you’re not already familiar with the crossings. Pacific Northwest weather can be undependable. Rain one minute, brilliant sun the next. This app offers expected temperatures, wind conditions and precipitation on color-coded maps. You’ll find weather from Astoria to Zillah, covering all of Washington and Oregon. The downside? No BC weather. The upside – kids seem to love playing with weather maps. So, because there’s no BC weather in the previous app, you’ll need this one, which lists the latest temps (Celsius, Fahrenheit or Kelvin), plus a 7-day forecast. You choose the location(s) that you’ll be in, or let the GPS tell Atmospherique where you are. Should you bring a jacket for your walk through Victoria? The app tells you the chance of precipitation. If you share your home with a Twilight fan, check out this app. It shows various Washington and Oregon filming locations, along with maps so you can find the exact destination. It even outlines the movie’s run time in the Twilight for each locale. I’m not a huge Twilight fan, so I’m not the best person to fact-check this one. But I’d love to hear your thoughts on it. Identify the Olympic National Park’s animals, trees, flowers and plants with gorgeous full-color photographs. Download details on all of the above, plus info about local towns, campgrounds and special points of interest. I do wish that the Google Map displayed all 900,000 acres with push-pins for towns, campgrounds and points of interest. It can be difficult to understand the lay of the land, unless you’re already familiar with the park. Why does a certain snake’s Latin name translate to “silent fate?” Find out this fascinating fact – plus dozens more – from the Woodland Park Zoo’s fantastic app. I really like the valuable daily schedule: when the giraffes are fed, when zookeepers give talks and when the puppet show begins. Find your travel companions on the grounds with the GPS-enabled app, or use the map to make your way around the 188-acre zoo. A fabulous use of technology. This app functions like a simple, selective tourism guide. You’ll see Victoria’s 30 main attractions listed with a brief description of each, the hours, website, phone number and address. Tap on the address, and your web browser opens to the attraction’s exact location on Google maps. It’s a great, basic app for anyone Victoria-bound for the day or a weekend. This app makes quick work of the Washington State Ferry System, and it’s a necessary asset for anyone traveling through the Pacific Northwest during the crowded summer season. Real-time info on schedules, crossing times, fares, alerts and delays throughout the Pacific Northwest’s most popular destinations, including the San Juan Islands, Friday Harbor, West Seattle and Sidney, BC. The Portland Art Museum offers awesome, ongoing family programming. But if you’re not at the museum on a family programming day, this app offers streaming podcasts from experienced curators, who explain the PAM’s collection to you (and then you can explain that ultra-modern piece to the kids, perhaps). Some teens may also enjoy the podcasts. Bring earphones – and be aware that some explanations can be rather lengthy. The app’s map is solid and useful. Many children played a simpler, green-screen version of this game in elementary school. Now your children can round up the wagons, cattle and kids for a journey out west. Learn to hunt, fish and pan for gold – while avoiding dysentery, bandits and bad weather. The game presents one-line history trivia on the Oregon Trail, so kids get a dose of pain-free learning. Advancing levels ensure that there’s always a new challenge, and the graphics are simply adorable. A phonebook-like app pointing out over 4,000 of BC’s popular attractions, restaurants, visitor centres and towns. The app interacts with your phone’s GPS to point out great options by distance, in kilometers and miles from your current location. The attractions aren’t organized, so you’ll find spas mixed in with whale watching and casinos next to military museums. However, the app is extremely comprehensive. There are phone number and website for each listing, plus links to additional information on HelloBC.com. An image-heavy app of Pacific Northwest National and State parks. View Oregon and Washington mountains, lakes, parks and historic sites. The web icon on each takes you directly to the online National Park sites for more information. But basically, it’s a slideshow of travel possibilities, with photos of varying quality. Try the “Ken Burns effect” for fun. In this app, you’ll find traffic cams throughout the state, the speed of traffic in the Portland area, and events categorized by Oregon region. All information is sourced from the Oregon Department of Transportation and Travel Oregon. I wish that more non-event activities were listed in “Things to Do,” and that more lodging options were listed (only two?!). But the statewide traffic information is handy. What did I miss? E-mail me your suggestions.